Taiwan is party to the same territorial disputes in the South China Sea and East China Sea as China, and the claims of the two are practically equal. China considers Taiwan’s involvement as support for its own claims, as well as a symbol of Taiwan’s adherence to the One China principle. The recent switch in Taiwan’s ruling party may lead to fundamental changes in Taiwan’s position. 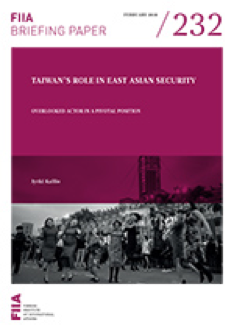 Taiwan could be downplaying the historical claims, and focus on factual jurisdiction. If the Democratic Progressive Party remains in power after 2020, it is possible that Taiwan will discard some or all of its claims in the South China Sea. These changes are part of the process of “normalizing” Taiwan as a state actor by cutting the historical ties to China. This is not regarded in positive terms by China, but by proceeding in gradual steps Taiwan may avoid hostile reactions. Showing support for this process is the most tenable way for the international community to promote peace and stability in the region. Further sidelining Taiwan would amount to giving China a free hand and increase the risk of a military conflict.